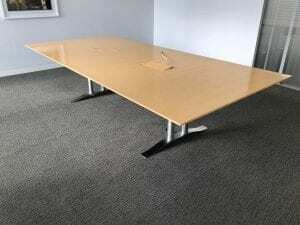 This maple meeting table is perfect for accommodating a large group of people. With 2 strategically placed power modules, this table allows users to easily plug into power sources. Supported by a sturdy, stylish chrome frame, it will certainly add style to your meeting space. Dimensions (mm): 3200 x 1400. Otherwise, if this table are is exactly what you are looking for, we have an extensive range of other second hand tables in stock. Just click on the link provided, or simply enter your details into our ‘Request a Quote Online’ form below and one of our sales team will be in touch very soon.